Senior Action depends on a team of faithful volunteers to provide dynamic services and programs to seniors each day. From serving meals at one of our dining sites to touring a group of new members, to teaching a class or serving on the Board. In addition, because we believe strongly in the power of community service, our volunteer program even places seniors in service roles with other non-profit organizations in Greenville. Every volunteer makes a difference. Are you 55+? Consider becoming a member of the Retired and Senior Volunteer Program (RSVP). 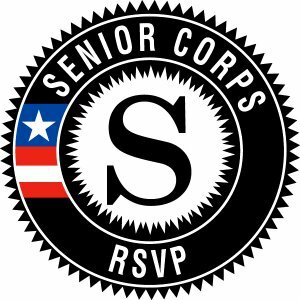 RSVP recruits and places senior volunteers (55+) in meaningful roles that make the biggest impact on the community. RSVP at Senior Action focuses on projects that improve the lives of homebound seniors, strengthens our education system, and promotes financial literacy. 1. Volunteers live longer and are healthier. 2. Volunteering establishes strong relationships. Even though we have more ways than ever to connect with people and communicate, people are lonelier now than ever before. Studies have recently revealed that one in three adults believe they are lonely. While social media may help us stay connected with friends, it is not helpful in creating new friendships. It also does not help us connect with our families, quite possibly just the opposite. What better way to build strong relationships with your family and children than to serve the community together. 3. Volunteering is good for your career. People who volunteer make more money and have more opportunities than those who do not. Volunteering is a great way to make connections that can lead to career opportunities. 4. Volunteering is good for society. 5. Volunteering gives you a sense of purpose. Having a sense of purpose is key to a healthy and long life. For younger people, they often find that purpose in school or activities. As we age, we find it in our work and family commitments. However, as people retire, it becomes more difficult to find. When someone chooses to give of their time to someone else, without being paid for it, it creates a strong sense of purpose and personal meaning. If you are one of the 75% of Americans who are not currently volunteering, we invite you to get involved with Senior Action. We have a variety of opportunities that may be just perfect for you. You will get back much more than you ever dreamed. Complete a volunteer interest form to get started and learn more about each opportunity. Help us set-up and serve lunch to over 30 seniors – no cooking required! We serve from Monday to Friday from 10:45 AM to 1:30 PM. Opportunities to serve lunch are available at all nine Senior Action locations. Are you a people-person that loves to multi-task? Consider helping us at the front desk at our main office location on Directors Drive. Typically, we need extra hands at the beginning of each quarter (February, May, August, and November) and around the 15th of each month. Make welcome phone calls or give tours to new members. This is the perfect role for anyone that loves Senior Action. The schedule is very flexible. Help us enter data into a computer, check voicemails, or assist with mailings. We are always looking for volunteers that can help us “behind the scenes” at our main office location. We will work with your schedule. Do you have a skill you can share with others? Maybe you are a retired photographer (or just an enthusiast) or you have a knack for arranging flowers or bee keeping? Maybe you can play an instrument or have a special artistic talent? We need you at Senior Action to share your skills and talents with other. Class instructors are needed at all nine of our locations. From January through April, join AARP Tax Aide to help thousands of residents file their taxes free. Serve as a tax preparer, waiting room facilitator, or appointment scheduler. There are over 200 children in Greenville county waiting for a mentor. You have so much wisdom and experience to share, so consider becoming a mentor. RSVP works with several great mentoring organizations that can match you with your new best friend. Are you handy around the house? Sometimes even changing a lightbulb can be a challenge for the seniors. Join with others and use your skills to help seniors complete simple home repair and improvement projects. © Copyright Senior Action. All rights reserved.